Local law enforcement conducted another crosswalk crackdown on Aug. 26 as students across Orange County returned to school from summer break. Dubbed Operation Best Foot Forward, the Orlando Police Department (OPD) and the Orange County Sherriff’s Office (OCSO) issued tickets and verbal warnings to over 200 drivers. Motorists were pulled over if they failed to yield to a plainclothes officer crossing the street in a marked crosswalk. While many motorists obeyed Florida’s Driver Yield Law, the OPD and OCSO collectively gave out 122 citations and 78 verbal warnings. 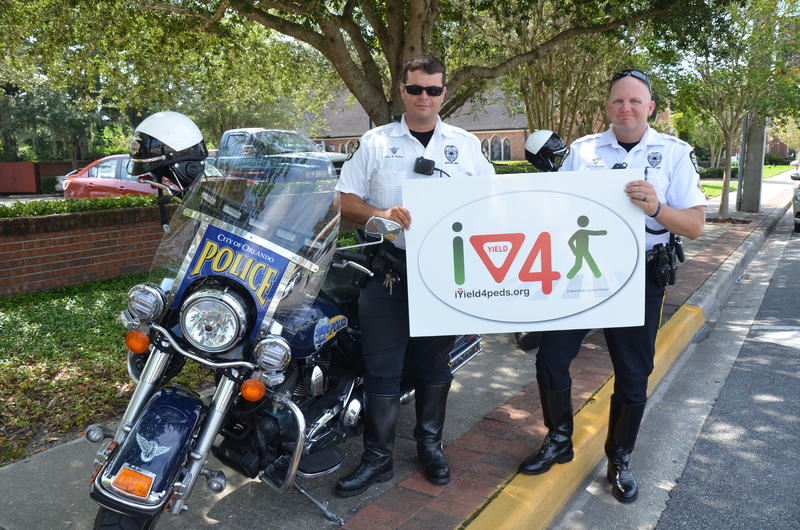 Operation Best Foot Forward’s August enforcement event was timed with the first week of school to encourage drivers to be on the lookout for students who are walking and biking to class. One special guest came out to show his support for OCSO deputies at the Pine Hills & El Trio Way crosswalk enforcement detail. Orange County Commissioner Bryan Nelson stopped by to chat with both the OCSO enforcement team and the media about the importance of driver yield laws and pedestrian safety. Read more about our media coverage as well as our full report here.